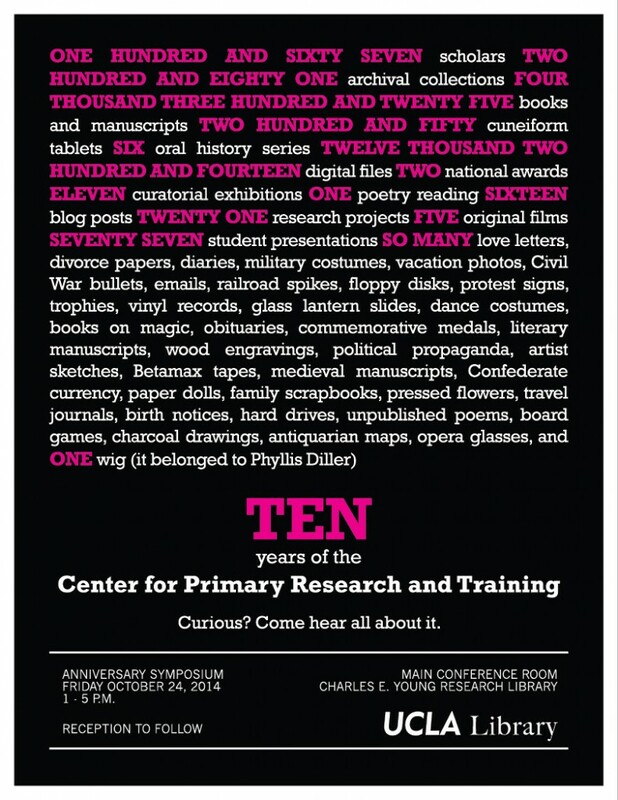 This year marks the 10 year anniversary of the Center for Primary Research and Training! In celebration, UCLA Library Special Collections is hosting a half-day symposium on October 24, 2014 in the main conference room of Young Research Library from 1-5pm. A reception in Library Special Collections will follow. The symposium will feature presentations and remarks from nine current and former UCLA graduate students. Thai Jones, PhD History (Columbia University) and currently the curator for US History at Columbia’s Rare Book & Manuscript Library, will deliver the keynote address. For a schedule, the complete list of speakers, and to RSVP, please visit http://cfprt.eventbrite.com. This event is free and open to the public, so please share widely. RSVPs are requested by October 17, 2014.